I love Chanel, I mean how can you not, it’s Chanel! I love so many of their perfumes but so far I have found no love for Les Exclusifs de Chanel. This is partly due to the fact that I haven’t spent much time investigating them, but each time I dive in and test them my general impression is that they’re nice and obviously very high quality but they don’t draw me in, and I’m yet to find the one for me. The somewhat awkwardly named Jersey was released last year and is the latest addition to the Les Exclusifs line and it takes it’s awkward name from the fabric that Chanel “daringly appropriated from menswear by Coco Chanel for women’s fashions.”  That may be so, but I can’t get over just how dreadful the name is, it doesn’t befit the style and class that I expect from Chanel, but then again they did name one of the other Les Exclusifs ‘Beige’, so perhaps they don’t have a 100% brilliant track record when it comes to names. Chanel describes Jersey as being “As light and liberating as the modern fabric for which it was named…An inspired composition, Jersey is evocative of a meadow lush with lavender – an essence previously worn only by men. A tender trail of Vanilla and Musk brings femininity to the forefront, and a rare, sophisticated new scent is born.”  I would describe it as ‘a granny lavender on the warpath’. Jersey is a lavender, but it’s not the good kind of lavender, it is what I would call a ‘granny lavender’, as in the kind of lavender that smells of old ladies. The lavender in Jersey starts out fresh, zingy and herbal, but it very quickly becomes sweet and powdery. Make that VERY sweet and powdery. Now, I never shy away from a bit of powder, but I have learned that powder and lavender = old lady, and not the cool kind, you wouldn’t catch my Grandma in this. One of the best things about lavender is it’s burned, caramel like facet. A facet which is emphasised wonderfully in perfumes such as Vero Kern’s Kiki, By Kilian’s A Taste of Heaven, Dior’s Eau Noire and Hermès’ Brin de Reglisse. In Jersey this caramel-like aspect is pushed to an uncomfortable level of cloying sweetness that makes for a rather unwelcome heavy quality that seems at odds with the concept of a “light and liberating”  perfume. The cloying sweetness is amplified by vanilla, benzoin and musk, It feels a bit like Prada Candy, but without the fun. This blend is oddly suffocating and I find it difficult to detect anything other than the lavender, vanilla, benzoin and musk. The other florals are completely squashed into submission and Jersey feels fairly linear, and dare i say ‘fairly dull’. Jersey isn’t a dreadful perfume, it’s just not good enough to be a Chanel. I expect a certain degree of artistry with a Chanel perfume, they never scrimp on quality but their recent launches (Bleu de Chanel & N°19 Poudré) have lacked that artisanal touch we are so used to. I think is why I found Jersey so disappointing, it feels muddled and it doesn’t have the usual crystalline focus that the best Chanel’s have. Go granny go? More like go away granny, go away. Jersey is part of Les Exclusifs de Chanel and is available in 75ml and 200ml Eau de Toilette. Prices range from £100-£180. This review is based on a sample of Jersey generously donated by Tara of Olfactoria’s Travels. Posted in Chanel, Floral, Musk, Perfume Reviews, Unisex and tagged 2011 Release, Chanel, Floral, Jersey, Lavender, Les Exclusifs de Chanel, Unisex. Bookmark the permalink. I am going to Manchester soon in the hope of finding an exclusif that I love enough to buy, this does not sound like the one for me though, lavender already had me running for the hills. I feel I may end up saving my money and buying one of the guerlain exclusives instead as there are many I love and consider fb worthy. Great review on the perfume, it has not been well received by a lot of people. Hopefully they will get their act together soon, although I still covet a bag and the new glasses. I’d definitely take one of the Guerlain exclusives over one of the Chanels, although No 22 may end up being something I like. I’m still unsure. I haven’t tried this one, yet. I think I have a sample somewhere on my desk, but this hardly encourages me to scurry over and find it! Which of the les Exclusifs have you tried? I actually love Beige, and while the name is odd it does suit Coco herself, as this was her favorite – and much used!- color. Bois des Iles is in my Top 5 of all time, probably in the #1 slot most days you ask. Cuir de Russie is to birch tar-y for me, or at least it was when I first tried it. I need to revisit it, as I do love leathers. No 22 is not for me. Coromandel is! I love it. Also a Top 5 scent. Sycamore is… okay. But that’s more about my acceptance of vetiver than it is about the scent itself. I haven’t tried the others. I’ve tried all of them very briefly in store, but I have spent the most time with Cuir de Russie, Jersey and No 22. Jersey’s a funny one for me. I’ve never found a Chanel that worked on my skin (Cuir de Russie makes me smell like I’ve had a run-in with an incontinent cat) but my mother’s skin seems to bring out the best in every Exclusif she tries. I found Jersey the epitome of ‘meh’ when I first smelled it, but every time she wears it I end up asking what that lovely smell is. And I’m not a lavender fan at all. You should definitely spend some more time with Bois des Iles – that one is definitely worthy of the Chanel name. Oh dear, it sounds like Cuir de Russie and you don’t get on at all! I totally get your incontinent cat analogy though! Your mother sounds like she has magic Chanel skin. That’s another vote for Bois des Iles, it’s officially on the list now. But Jersey is a shame. I totally agree with Go away, Granny! I love quite a few of the Exclusifs, but with this one they lost me at the lavender. It had a terrible laundry musk quality to it and was really strident to my nose. And I did spend some (rather distressing) time with it on skin. 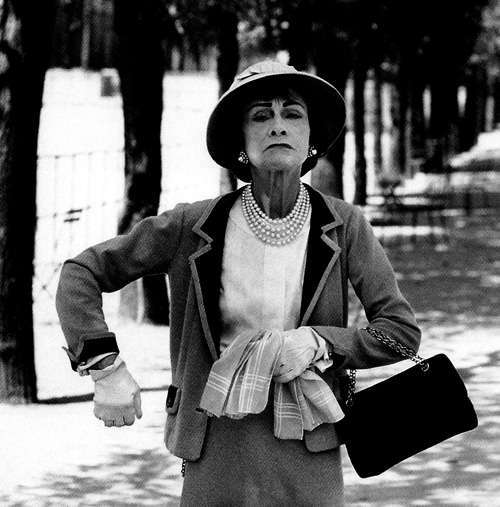 Interesting to see that photo of Coco Chanel. I am reading her biography at the moment – very very slowly – and after 150 pages the woman is still only 35, but has packed in a lot of very un-beige and un-jerseylike experiences! Which is your favourite of the Exclusifs? Strident is a fitting description for Jersey, it’s quite unpleasant at times. Fave Exclusifs are 31 RC, Bois des Iles and Beige, Bel Respiro and the Cologne one. That’s a lot, right? You can definitely keep the Gardenia. Biog is good, especially because of the un-beige goings on. Might review it if I ever get to Coco at pensionable age. What a great review! My sample was put to very good use 🙂 The granny references cracked me up. Your thoughts are exactly the same as mine on this one – not terrible, but terribly disappointing and unworthy of the Chanel name and price tag. What is going on? You may well get along with No. 22 if you are OK with soapy accords in perfume (which I’m not). Cuir de Russie, Bois des Iles and 31RC are my faves. I have no idea what is going on at Chanel, their last three releases have been bland to say the least and Jersey takes the pee. I rather like Jersey. But I agree, it is overpriced for what it is. The only lavender I really NEEEEEEEEED in my collection is Andy Tauer’s Reverie au Jardin. I own, and love, No. 22. You kind of have to love aldehydes to enjoy it, I must say. And I love me some aldehydes. I would like to spend more time with Bois des Iles as well. Ooh, I have a sample of Reverie au Jardin, but I haven’t really had a chance to try it yet. It sounds like it may be a reference lavender then? I love me some aldehydes too! No 22 is starting to sound pretty damn good. I’m somewhat like mals, I don’t generally care for lavender. But I love Reverie au Jardin. And Jersey was alright. Reverie au Jardin is my ultimate lavender holy grail, I think. Be curious to see what you think of No. 22! ‘Ultimate lavender holy grail’ is good enough for me, I shall dig out my sample! Hmm, I agree, although I see it more of a case that Jersey amps up the sweet powdery-ness so much it becomes unpleasant. Cuir de Russie seems to be most popular! Well your comment just made my day, thank you Natalie! I have several favorite Exclusifs but Jersey isn’t one of them. I do not mind the lavender opening but 10 minutes isn’t enough! Because after 10 minutes it’s exactly like you described it – “uncomfortable level of cloying sweetness”. “Granny from Hell” = Jersey, indeed! Thomas, Bois des Iles and Cuir de Russie are available in parfum/extrait (I own a 15ml bottle of the former) but obviously these are modern day formulations. Ahh cool, thanks for the info! I love reading that you haven’t connected with the Les Exclusifs line… as terrible of me that sounds. I don’t see the rave with them either, I have only gave them all a very brief sniffings and some skin wears (Cuir de Russie, Coromandel, Sycomore to name a few), I haven’t been impressed at all. I’m actually not a fan of the Chanel line at all, I don’t enjoy any one of their fragrances. And Cuir de Russie, people saying it’s the best leather… oh man, it was just a grim bunch of florals a top a pale leather fart. It’s interesting that you don’t like the entire Chanel range, they do have some amazing scents. I personally love No 5, No 19 and Coco. Have you tried those? LOL @ ‘Pale leather fart’! my sentiments exactly – @pale leather fart – brilliant!! What a shame, I guess I’m the only lady under the age or 65 that quite likes this scent. So far I have been having a great run with the Les Exclusifs collection. That said, I probably jinxed myself. I’m glad that you’re liking Jersey, it just wasn’t for me I’m afraid! Which of the Les Exclusifs are you liking at the moment? Oh yes my lovely Duc, this one is right up your street!